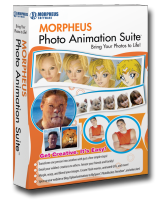 nice...how can you get this size of morphing? is it an AVI file? Nice and smooth. Try it without the glasses and it'll seem real. People to animal morphs are tough. But this came out pretty decent. A fellow Minion, Burt becomes Leatherface! View Cabfan's gallery of animations for more.